On March 15, 1990 dedication ceremonies were held for the new 16-acre cargo facility on the South Ramp of Honolulu International Airport. The new facility was divided into four lease lots on which tenants could build their own cargo facilities. Fronting the facility is a new aircraft parking apron which can hold four 747 jumbo jet aircraft. United Parcel Service and Federal Express are the two main tenants at the new facility. Also on the South Ramp, construction was proceeding on a firefighter training facility which includes a 1,500-foot burn pit, fuel storage tank, observation and control tower, storage building and a pier and boat house for the crash fire rescue boat. On March 25, 1990, Discovery Air iniated interisland service using BAE 146 aircraft. 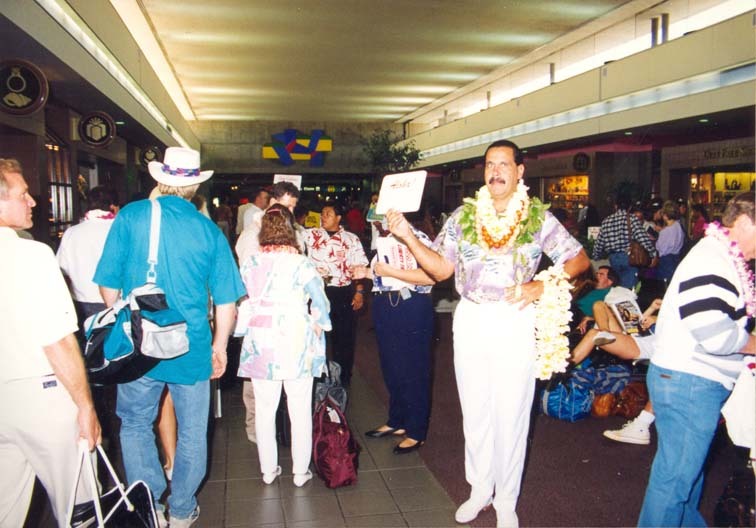 In April 1990, the Aloha Lounge at Honolulu International Airport opened, giving arriving foreign passengers a comfortable place to relax while waiting to enter Immigration and Customs processing. The lounge, which can hold up to three flights of passengers at a time, offered waiting passengers restrooms, telephones, ample seating, free fruit juice and videos. Work to improve the Flight Information Display System was also underway. The existing hardware and software of the system was being modified and additional monitors and baggage claim boards were being installed. Installation of a non-potable water distribution system to irrigate landscaping through the airport had begun. New Tour Aircraft Operator Permit Rules went into effect in May 1990. All tour aircraft operating out of state airports were required to obtain permits. In applying for the permit, operators were required to submit maps of the routes and frequencies and altitudes that their companies fly. While the state cannot regulate air routes, the Department was working with representatives from the community and the helicopter industry to develop guidelines for tour aircraft operations that would be beneficial to both the aircraft operators and the impacted communities. Realizing the economic benefits of opening new air routes to Japan, the State, led by Governor John Waihee, was successful in having bilateral talks between the U.S. and Japan reconvened in 1988. The HDOT represented the State in the U.S.-Japan Service Case and the U.S. Gateway Proceedings in which Hawaii was recommended for routes involving Japan gateway cities. Final approval of the routes came in October 1990. Each route added more than $300 million to the state’s economy per year. In addition to the Japan routes, efforts have been successful at increasing air service at Honolulu International. Carriers that have increased air service are Malaysia Air with service from Kuala Lumpur; American Airlines with service to Australia; Northwest and American Airlines, with service to Seoul; and Japan Air Systems and All Nippon Airways, with service from Japan. Carriers that have increased their frequency of air service to Honolulu are Japan Air System and Continental, Korean, Hawaiian, Northwest and United Airlines. In FY 1990, Congress passed an amendment to section 511(a)(12) of the U.S. Airport and Airway Improvement Act of 1982, which allowed the State of Hawaii to spend up to $250 million of duty free revenues to build and improve state highways around state airports. Under the amendment, Hawaii became the first state to be exempted from the federal law requiring all airport revenues to be spent only on airport improvements. The amendment permitted the transfer of duty free revenues to be used on highway projects within 10 miles of a state airport. However, duty free revenues could only be transferred after the revenues generated exceed 150 percent of the projected airport capital and operating costs for a given year. Revenues generated were transferred to a Transportation Use Special Fund, established by Act 309 of the 1989 Legislature and amended by Act 149 of the 1990 Legislature. By June of 1990, $166,919,433 had been transferred to the Transportation Use Special Fund. The Ala Wai Heliport, previously run by the Department, was closed on May 23, 1990 in response to growing public concern over safety and noise from increasing operations at the heliport. 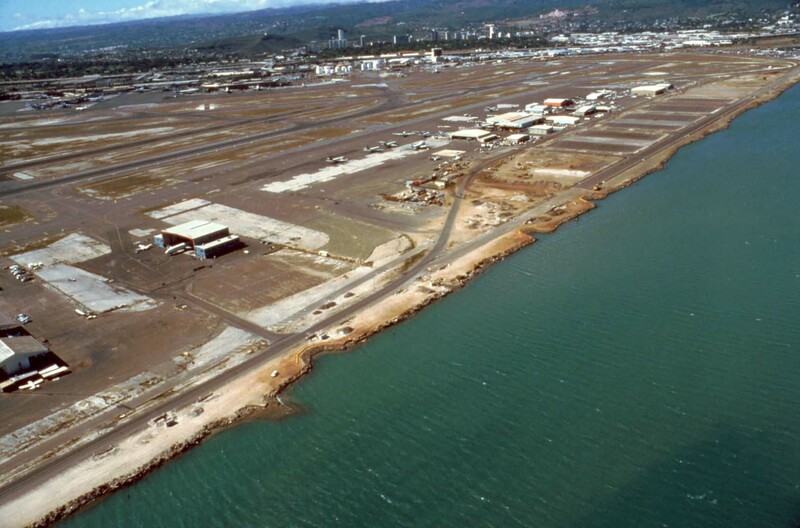 By June 1990, a large HNL air cargo complex was planned for Ualena Street Makai and 24 acres of land was acquired. For the first time in 11 years, visitor arrivals decreased in 1991. The Gulf War and poor economic conditions in much of the United States contributed to a decline in the number of passengers for the first part of 1991. Recovery from the slump was helped by an increase in visitors from Asia and the Pacific. Honolulu International Airport handled a total of 22.3 million passengers in FY 1991, a 3.3 percent decrease from the previous year. Foundation and utility work for the new Interisland Terminal Building was completed in October 1990. Under construction was the $136 million Central Building. Lei Stand facilities were relocated south of their old location to make room for the new Interisland Terminal Complex up-ramp to the second-level roadway. Plans were underway to convert the public parking area adjacent to the new lei stands into a garden area, which would include a replica of the fountain that was originally built along the entrance road into the airport in 1962. Phase II of the Interisland Cargo Facility was completed in September 1991. The project included construction of a culvert over the Manuwai Canal, new taxiways, hardstands and fueling system. The next phase, currently in design, will realign Kuntz Avenue, provide utility connections, and additional culverts over the canal. 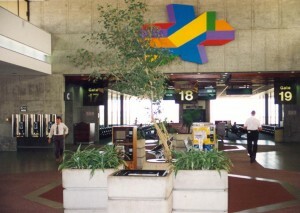 Operations at the Commuter Terminal were relocated to Lobby 2 of the current Interisland Terminal facilities in September 1990. Taxiways serving the Commuter Terminal were removed to allow construction of hardstand and fuel line connections to the new International Terminal Building. While design work continued on the new International Terminal Building, the Department proceeded with interim improvements to the International Arrivals Building to better accommodate passengers during Immigration and Naturalization Service inspections. Installation of movable partitions and modernization of the Ewa Baggage Claim Area allowed for figuration changes in Baggage Claim Area D for domestic and international flights. 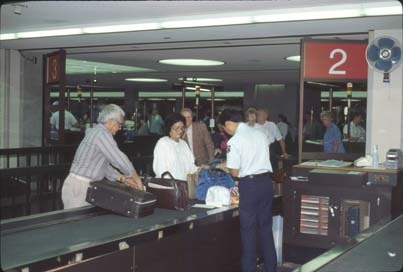 Other modifications in the International Arrival Building added eight INS booths and loft space by the end of 1991. The Department issued a request for proposals to build an Automated People Mover System at Honolulu International Airport in July 1990. In August 1991, AEG Westinghouse was awarded a $110 million contract for engineering, manufacturing, installation, and testing of the intra-airport rail system that would provide transportation between terminals and gates for airport users. Site preparations on the South Ramp for new and improved T-hangar facilities for the general aviation community began in March 1991. The project also included tie-down areas, aircraft transient parking, vehicle parking, and an air taxi terminal. The new air taxi terminal will have a central ticket lobby, waiting areas, restrooms, and office and meeting rooms for general aviation users. Also on the South Ramp, work was nearly completed on the Fire Fighter Training Facility, which includes a 150-foot burn pit, specifically designed to simulate a plane crash; fuel storage tank; storage building; and a pier and boat house for the crash fire rescue boat. Interior space for the Pacific Aerospace Museum was almost complete. Work included the construction of walls, flooring, a suspended acoustical ceiling, air conditioning, lighting, and electrical outlets. The museum was scheduled to open December 7, 1991. Three glass elevators were installed to provide access to the airline lounge areas in the Garden and above Gate 26. Holding area expansion and restroom improvements to Gates 12/13 and 24/25 were completed in August 1990. Work to improve the Flight Information Display System was completed in December 1990. The system hardware and software were modified and additional monitors and baggage claim boards installed. Work was underway on the second part of the system, which included management services, curbside displays, and new holdroom boards with baggage claim information. The new Airport Security System was installed by the end of 1991. The new access control system is able to identify each person with a badge who enters the Airport Operation Area. Efforts to increase air service at Honolulu International have been successful with the addition of America West Airlines’ new route to Nagoya, Japan; Hawaiian Airlines’ daily service to Fukuoka, Japan; and Japan Air System’s first flights to the U.S. between Honolulu and Tokyo’s Narita Airport. Joint hub operations at Honolulu International began in April 1991, as Canadian Airlines, Qantas and Air New Zealand, started their code-sharing flight operations. Passengers on Canadian Airlines bound for New Zealand, Australia or Fiji transferred to Qantas or Air New Zealand through a sterile transfer lounge in the Ewa Concourse. 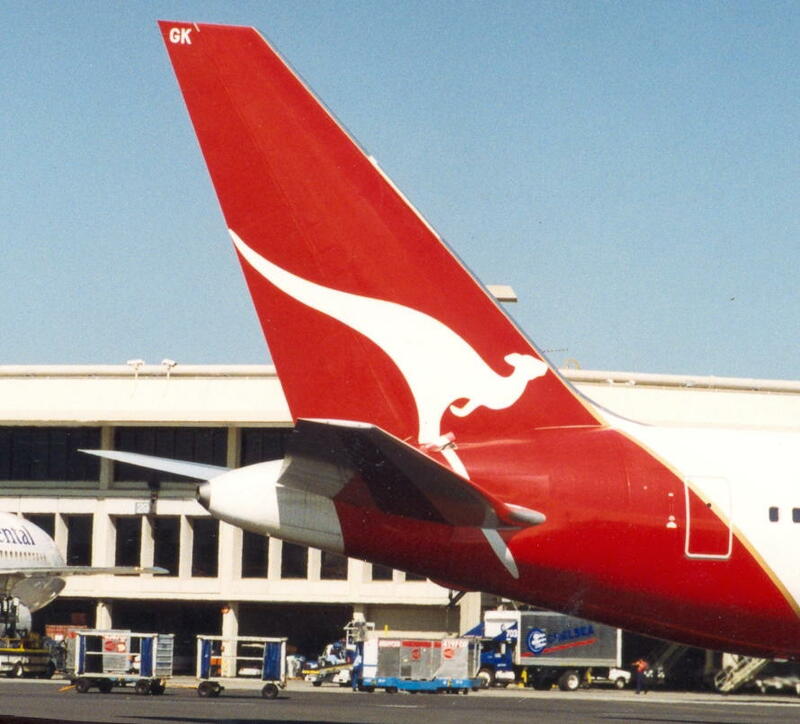 In return, Qantas and Air New Zealand passengers bound for Vancouver or Toronto transferred to Canadian Airlines. As a result of Governor John Waihee’s initiatives to improve processing for international arrivals at Honolulu International, an innovative program aimed at expediting passenger processing was undertaken. Visitor Information Program staff in the Immigration area direct passengers to queues and check that documents are properly filled out and in the correct order. Gateway receptionists in the International Arrivals Building act as translators for arriving passengers and inspectors. International Passenger Coordinators relieve Immigration and Customs staff from performing non-inspection duties. The number of Immigration inspectors increased from 85 to 93 in FY 91 and the number of inspection stations rose from 24 to 40. In a cooperative program instituted by United Airlines, the Immigration and Naturalization Service and the airport, the Advance Passenger Information System or “blue lane” system was developed. The “blue lane” system involved Immigration computer entries at check-in instead of arrival, and Immigration processing while the aircraft was in the air. Airport-Airline lease negotiations began in April 1991. The current Airport-Airline Lease between the state and the airlines expired July 31, 1992. Revised fees and changes will pay for increased costs for planned airport improvements and operations and maintenance expense. America West held its inaugural flight on February 1, 1991. 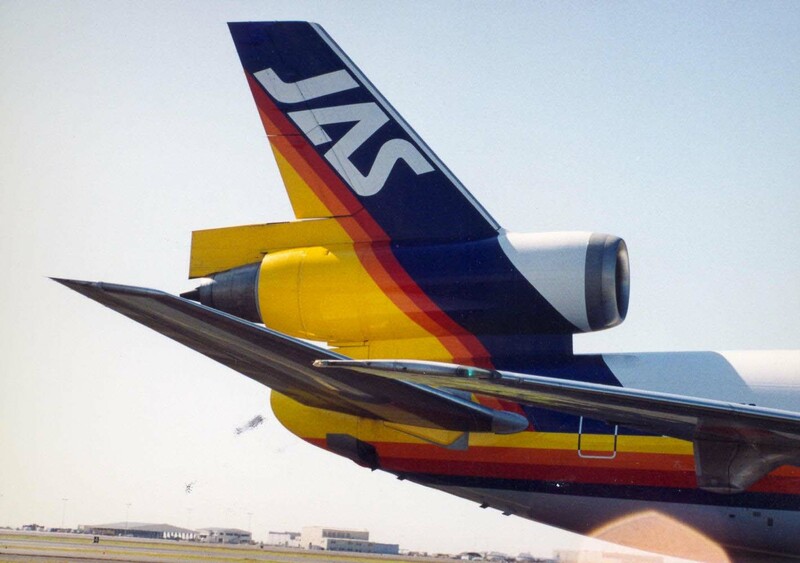 On June 3, 1991, Japan Air System held its inaugural flight to HNL. While many of the nation’s airports continued to suffer declines in passenger traffic in the wake of the Gulf War and the recession, Honolulu International managed to reverse the trend with a slight increase. 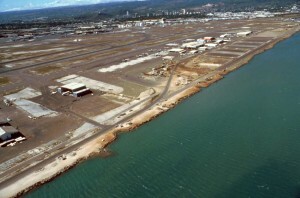 Nationally and worldwide, Honolulu International Airport remained among the busiest airports in 1991, ranking 10thbusiest in the United States, 15th busiest in the world, and fifth busiest in the Pacific Rim region. HNL handled 22,898,205 passengers in FY 92, up 2.6 percent from the previous fiscal year. Work continued on the new Interisland Terminal Complex which was expected to be completed in 1993. 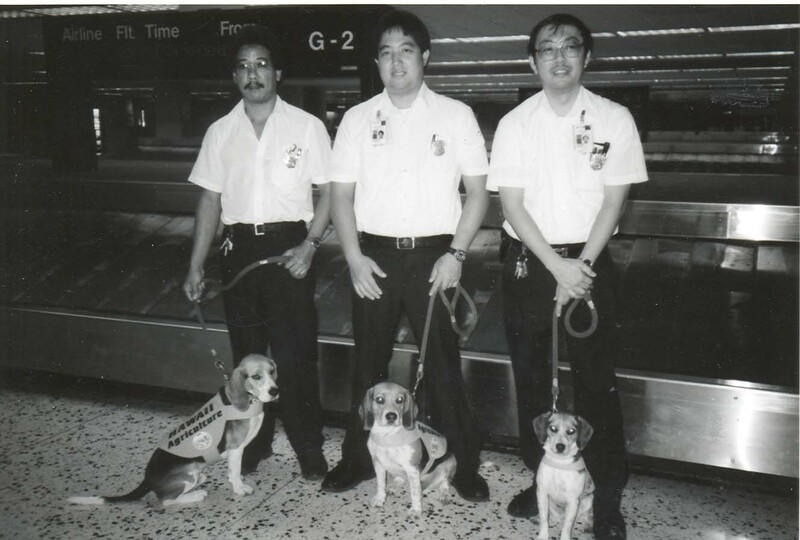 Hawaii’s position as the premier international gateway to the United States from the Pacific Rim required a facility that would adequately and expeditiously handle federal inspection processing of international passengers. Plans for a new International Terminal Building capable of handling 4,000 passengers per hour were redesigned and allowed the state to reduce the facility cost by $100 million. The new design for the four-level International Terminal Building included baggage handling areas, utility systems and tenant support facilities on the basement level. Federal Inspection Services facilities, baggage claim, concessions, and tour group facilities on the first level; passenger ticketing facilities, concessions, security screening, waiting lounges, agricultural inspections and tour group facilities on the second level; and connections to the automated people mover system on the third level. Cargo handled through HNL increased slightly from the previous year to 374,367 tons of interisland and overseas cargo in FY 92. Ongoing planning for a future Air Cargo Facility took a major step forward with the acquisition of 23.4 acres of land along Ualena Street where the new facility will be located. The first phase single-story structure will provide air cargo handling facilities for three major carriers. Construction of the Air Cargo Facility is scheduled for mid-1993 with the first phase targeted for completion in early 1994. Also to be housed on Ualena Street will be the maintenance facility of the future Automated People Mover System which was named Kumulani meaning “base of the sky” or “horizon”. When completed in 1996, Kumulani will provide a practical means for getting around HNL, replacing the Wiki Wiki bus. Blue and white was selected for Kumulani’sofficial colors, and a flag-shaped symbol was chosen for the system’s logo. New general aviation facilities at the South Ramp were completed with the construction of 81 new T-hangars, an aircraft tie down area, and a transient aircraft parking area. Space was also provided for small fixed-based operators, private aircraft hangars and automobile parking. 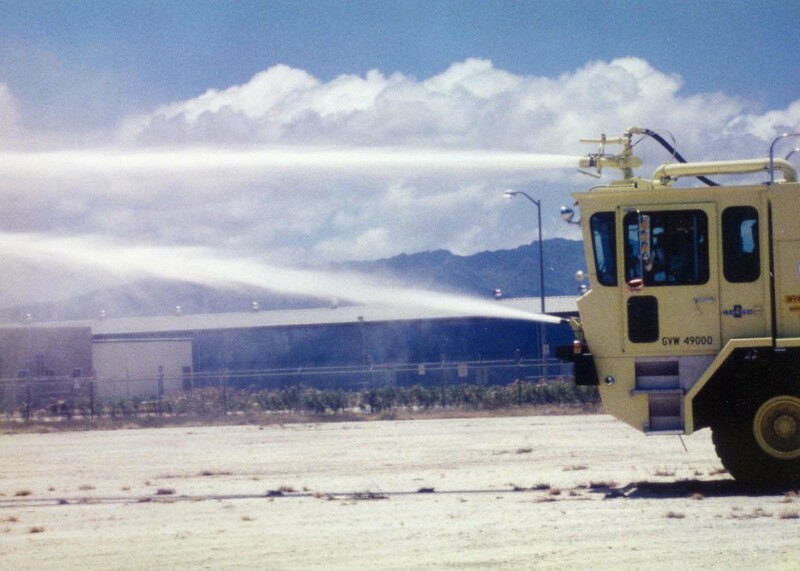 A new Aircraft Rescue and Firefighting Station was dedicated on April 24, 1992. The $4.6 million, 13,328 square foot facility included an exercise room, large kitchen facility, training room, and individual bunk rooms. Phase II of the Pacific Aerospace Museum opened on June 3, 1992 with six new interactive computer displays that allow visitors to get a hands on approach to learning about flight and space. Located in the Central Lobby, the Museum showcased a variety of exhibits, including a multi-media theater that features a historical tour of significant Pacific exploration events. Japan Air Charter held its inaugural flight to HNL in July 1991. A dedication ceremony was held for the new Lei Stands on July 31, 1991. 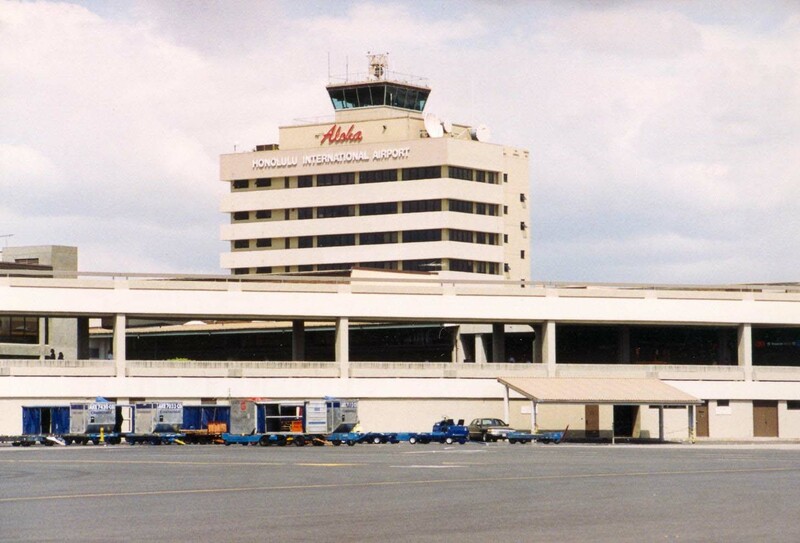 A groundbreaking was held on November 6, 1991 for the construction of Gates 31-34, Phase I.
Honolulu International continued to be one of the world’s busiest airports, handing 22.2 million people in FY 93. The airport system experienced a substantial drop in revenues due to the reduced amount of the Duty Free concession contract. The revenue generated from the Duty Free contract declined from approximately $300 million in the final year of the old contract to $100 million in the first year of the new contract. The reduction, coupled with the current economic difficulties being experienced by the airlines, led to the deferment of the new International Terminal Building, People Mover and other construction projects. Work began on the new Airport Training Center Building on the South Ramp. When completed in 1994, the project will provide work shops and classrooms for staff and up to 150 Honolulu Community College students studying aviation related fields. Hurricane Iniki hit Kauai on September 11, 1992 with winds of more than 100 miles an hour and gusting to 160 m.p.h. The hurricane affected all State airports for two days as aircraft were stored at Hilo Airport. Five million dollars of damage was done to Lihue Airport and regular interisland flights to Lihue were discontinued for two weeks while National Guard and State emergency units attempted to restore power. C-5 Aircraft unloaded telephone poles on taxiways. Seven thousand people were evacuated from the island within two days after the storm and 1,000 more on the third day. The tremendous damage on Kauai affected the tourist industry on that island for many years. Flights from Honolulu to Kauai were affected during the recovery period. On November 21, 1992, Lufthansa flew an Airbus 340 direct from Frankfurt to Honolulu in 15 hours as a demonstration of a direct tourist connection to Europe. The Aviation Education Resource Center was dedicated on January 11, 1993. The HDOT Airports Division moved its offices from above Gates 29-31 to the seventh level of the new Interisland Terminal Building in February 1993. Honolulu International was the 15th busiest airport in the United States in FY 94, handling 22.4 million passengers. 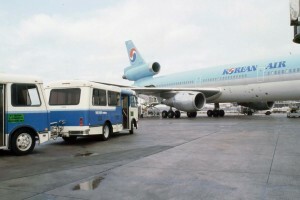 Asiana Airlines inaugurated service from Korea to Honolulu on July 20, 1993. 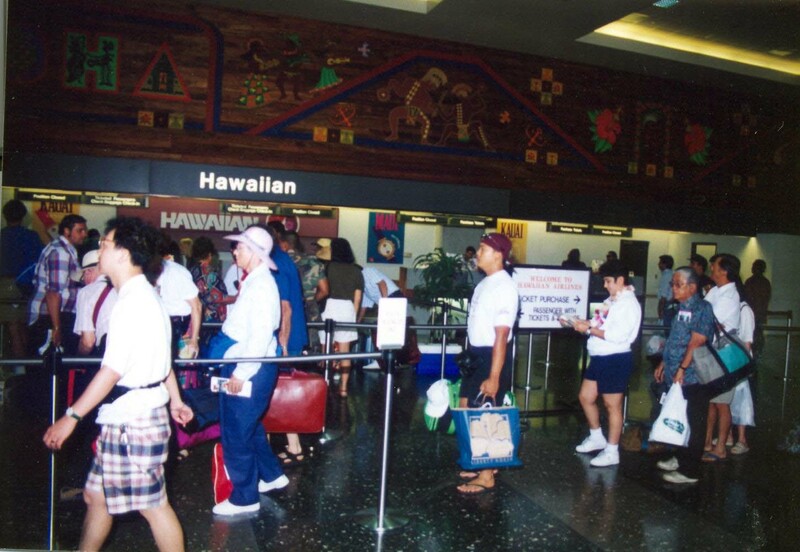 On July 21, 1993, the Interisland Terminal opened its doors for business. The opening of the $137 million complex culminated more than 10 years of planning and construction. The largest airport project ever undertaken by the airport, the Interisland Terminal was a seven-floor, 600,000 square foot structure with parking for 1,726 vehicles, a station for the intra-airport transportation system, ticket lobbies, concessions, passenger waiting areas, baggage claim and offices for the State Airports Division. 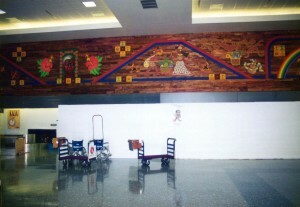 Gates 31 to 34 in the Ewa Concourse were dedicated on January 21, 1994. The project provided four passenger holdrooms and three gates able to handle widebody aircraft. The State completed two projects on Hickam Air Force Base in compensation for land acquired from the Air Force. Housing facilities were dedicated on January 14, 1994, and similar ceremonies were held on April 8, 1994 for a dormitory building. Work continued on a new Airport Training Center on Lagoon Drive on the South Ramp. When completed in March 1995, this project will replace the existing buildings located makai of the Interisland Maintenance Base. The new training center will provide up-to-date workshops and classrooms operated by Honolulu Community College for students studying aviation-related courses and for airport employees. In FY 94, 25 percent of the aircraft operations at HNL involved general aviation aircraft of less than 12,500 pounds gross weight. The state continued to seek a general aviation reliever airport which would substantially reduce current and future air traffic congestion and delays while enhancing safety at HNL. Past attempts to acquire or build a general aviation reliever airport failed. However, with the downsizing of the U.S. military, Barbers Point Naval Air Station was scheduled to close in 1997. The airport is working with the federal government and the State-County Reuse Committee on acquiring a portion of BPNAS for use as a general aviation reliever airport. Trans Executive Airlines (Trans Air) began commuter service from Honolulu to Waimea-Kohala Airport with Cessna 402 aircraft in 1993 as did Caledonian Airways. Their charter flights from London to Vancouver to Honolulu with DC-10 aircraft were short-lived. The Hawaii Government Employees Association went on strike on April 18, 1994 for about a week. All State airports were kept operational during the strike. A dedication ceremony was held on April 8, 1994 for the new dormitory building at Hickam Air Force Base, which was built as compensation for land acquired from the Air Force. On April 21, 1994 a dedication ceremony was held for Gates 31 to 34 in the Ewa Concourse. Four passenger holdrooms and three gates able to handle wide body aircraft were added. Pleasant Hawaiian Holidays initiated air service on May 8, 1994 to Honolulu, Kahului and Keahole-Kona. Honolulu International was the 18th busiest airport in the United States, handling 23.2 million passengers in FY 95, an increase of 1.6 percent. Plans were being developed in 1994 for the renovation of the International Arrivals Building. The existing facility was more than 20 years old and not designed to handle the passenger traffic resulting from the larger aircraft now in use. The renovation will increase the available floor space, install faster baggage handling equipment and make modifications to process passengers more quickly and efficiently. The new Airport Training Center Building on the South Ramp was dedicated on May 18, 1995. This facility replaced the old facility on the Ewa side of the airport with up-to-date workshops and classrooms for Honolulu Community College students in aviation related fields. Work began on the Makai Pier Extension to the Interisland Terminal on September 19, 1994. When completed, the project will add five additional gates and loading bridges to the Interisland Terminal. It will also provide a connecting link with a 240-foot moving walkway between the Interisland and Overseas Terminals. On May 15, 1995 work began on the International Terminal Building Complex Site Improvements, Parking and Landscaping project. This project provided an employee parking lot near the planned location of the International Terminal Complex. When completed, the project will save the State $2 million per year that is currently paid for busing airport employees to and from the Lagoon Drive parking lots. The State began working with the Barbers Point Naval Air Station Redevelopment Commission in 1995 on acquiring a portion of Barbers Point Naval Air Station for use as a general aviation reliever airport. With the planned closure of BPNAS in 1998, an opportunity existed for acquiring a reliever airport at little or no cost to the State. In FY 95 more than 22 percent of the aircraft operations at Honolulu International Airport involved general aviation aircraft (aircraft with less than 12,500 pounds gross weight). A general aviation reliever airport would substantially reduce current and future air traffic congestion and delays, while enhancing safety at HNL. Having BPNAS as a general reliever airport would also benefit the airlines by having it available as an alternate landing site; a requirement of the FAA. Without BPNAS, overseas flights have to designate either Kahului or Keahole Kona International Airport as an alternate and carry sufficient fuel to reach them. Having BPNAS as an alternate would save the airlines $2 million per year on fuel cost alone. By 1996, the State was working with the Barbers Point Naval Air Station Redevelopment Commission to acquire 725 acres at Barbers Point Naval Air Station for use as Kalaeloa General Aviation Reliever Airport. Acquisition of Barbers Point will make Honolulu International Airport safer and extend its capacity well into the future without additional runway construction; provide for general aviation training and compensation for the loss of Ford Island in 1999; satisfy the airlines need for an alternate landing area which will save them fuel; and provide a sturdy disaster relief base. Nationally, Honolulu was the 17th busiest airport in the United States in 1995, with 24.5 million passengers. 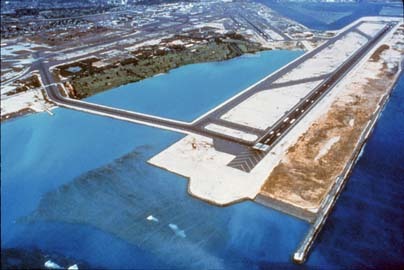 The Makai Pier extension to the Interisland Terminal was opened on October 20, 1995. This project added five additional gates and loading bridges to the Interisland Terminal. It also provided a connecting link at second and third level roadways with a 240-foot moving walkway between the Interisland and Overseas Terminals. Work on the International Terminal Building Complex Site Improvements, Parking and Landscaping project was completed in August 1996. This project provided an employee parking lot near the planned location of the International Terminal Complex. Honolulu International Airport was the 19th busiest airport in the United States and 30th in the world in Calendar Year 1996. Three major systems projects, emergency power for both the airfield and terminal and an update of the fire alarm system were started in FY 97. Work began on the relocation of the employee parking lot at Elliott Street. The parking lot was relocated because it is the future site of the new Federal Detention Center. Negotiations continued in 1996 with the Barbers Point Redevelopment Commission to acquire 750 acres at Barbers Point Naval Air Station for use as Kalaeloa General Aviation Reliever Airport when the Naval Station closes in 1999. The Coast Guard and Army National Guard will also be accommodated at Kalaeloa Airport and in the event of a natural disaster Kalaeloa Airport will be used as a staging area for disaster relief. In January 1997, Island Air ceased DH-8 operations into Princeville Airport on Kauai. Earlier they had operated with DH-6 aircraft twice daily from Honolulu. Mahalo Airlines added 20 daily flights between Honolulu and Kahului in 1997 by adding another aircraft. On September 2, 1997, Mahalo went out of business. On September 1, 1997, the State waived all airline landing fees for two years to encourage tourism which was in a downturn. Continental Airlines moved its DC-10 pilot base from Los Angeles to Honolulu in 1997 to create a mini-hub for growth in the Asia-Pacific market. They also added Houston to Honolulu service. Aloha Airlines began once a week service to Christmas Island in 1997. Modifications to the International Arrivals Building at Honolulu International Airport were completed in 1997. This provided exterior improvements for passenger comfort. Work included repairing and renovating the existing ground level Tour Group Baggage Loading Area and the existing second floor Tour Group Assembly Area, and construction a new glass roof over the Mall Tour Group Bus Waiting Area. The interior is under renovation in a second project which started in August 1998. In addition, a Hawaii Sense of Place was created through the use of landscaping and interior décor featuring Hawaiian patterns, natural materials, art work and music. A planning study for cargo marshaling facilities was in progress in 1997. The study will be completed by mid-1999 and is looking at existing cargo operations in order to determine facility and site requirements needed for agricultural and perishable goods. 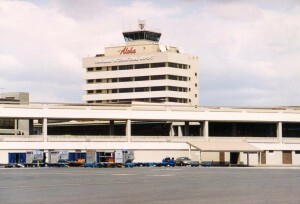 In Calendar Year 1997, Honolulu International was the 18th busiest airport in the United States and 33rd in the world. Construction was completed on 11 new aircraft hardstands. This project provided strengthened and more durable aircraft parking at the Interisland Terminal area. Two major private projects were constructed. The 85,000-square-foot Continental Airlines Heavy Maintenance Facility was dedicated on July 3, 1998. It allows maintenance of large aircraft locally in lieu of sending them to the mainland. The hangar cost $26.3 million and was financed with airport revenue bonds backed by the State. The facility can handle B747 aircraft. United Airline’s new state of the art cargo facility was completed in August 1998. It will provide more than 65,000 square feet of cargo space worth $7.8 million. This project was also financed by State Airport Revenue Bonds. This project required site work by the Airports Division worth $1.4 million which demolished existing buildings and utility lines. Harlequin Air, a subsidiary of Japan Air Service started charter operations to Honolulu in 1998. Also in 1998, Hawaiian Airlines added a flight to Pago Pago, American Samoa, several times a week. All Nippon Airways began flying twice weekly between Tokyo and Honolulu in 1998. In 1998, Aloha Airlines reduced its daily interisland schedule by 10 flights to 168 daily trips. The Hawaii International Air Cargo Symposium, September 15 and 16, 1998, examined opportunities associated with air cargo transportation in Hawaii and the Asia-Pacific Region. It also offered presentations and interactive discussions on the issues and conditions that affect Hawaii’s air cargo industry. Representatives from Hawaii-based producers, suppliers and freight forwarders, along with airline and government officials and other representatives involved in cargo and commodities transportation to and from the islands also participated in the forum. Participants contributed their insights and ideas relating to air cargo activities and examined the conditions, opportunities and challenges facing the development of the Hawaii Air Cargo Market. Input at the symposium provided information to augment future facilities planning, assist in seeking changes for the enhancement of air cargo distribution, processing and handling and help forge collaborative development of air cargo and air cargo derived business opportunities in the Hawaii market by all segments of the industry. Work is ongoing on the modifications to the interior of the International Arrivals Building. This project provides improvements to the baggage claim area, rest rooms, air conditioning, lighting, and provides a Hawaiian Sense of Place to the facility. The theme developed by the Hawaii Airports Cultural Advisory Committee for Honolulu International Airport is ancient Polynesian voyaging. Construction is ongoing throughout the concourse areas. Improvements include tiles with a wave motif, kapa pattern highlights on the walls, planter boxes and two stairway skylights to the Central Lobby Gardens. In calendar year 1998, Honolulu was the 23rd busiest airport in the United States, and 36th in the world. The FAA initiated construction of a $22 million Honolulu Center Radar Approach Control Facility (CERAP) which would allow the Center Radar Approach equipment and personnel to be moved from Diamond Head Crater to the Honolulu Air Traffic Control Tower adjacent to the Hickam Golf Course. The United State Department of Justice (DOJ) started construction of a $50 million Federal Detention Center on four acres of land adjacent to the Interisland Maintenance area. This project was constructed on former airport land that was purchased by DOJ. 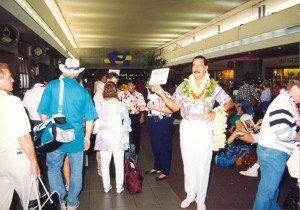 Aloha Airlines initiated electronic ticketing for interisland travelers in February 1999. Kitty Hawk Cargo, Inc. opurchased the American International Cargo facilities t HNL in 1999. Philippine Airlines resumed flights to HNL after a one-year suspension due to a strike in 1999. Nineteen ninety-nine was the year of concern for Y2K, the worry over whether embedded computer chips would recognize the year 2000 or would just shut everything down. A considerable consultant effort was expended to check and replace computer microchips where necessary but year 2000 came without any loss of operational capability. The State acquired 757 acres of surplus land at Barbers Point Naval Air Station as Kalaeloa Airport on July 1, 1999. Kalaeloa will be used by general aviation aircraft to practice pilot training, formerly done at Ford Island and Honolulu International, with up to 13,000 operations per month. It will continue to serve as an alternate airport for the many commercial air carriers serving Hawaii. In addition, the new airport will support disaster relief and civil defense operations. On July 1, 1999, operations at Ford Island shut down in tandem with the opening of Kalaeloa for general aviation. 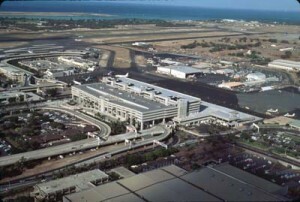 In Calendar Year 1999, Honolulu International was the 21st busiest airport in the United States and 36th in the world. For more information on the history of Honolulu International Airport, click on one of the decades below.